Epoch Failure is a NJ urban pop duo, resulting from the collaborative efforts of singer/producer Billy Joe Marrero and rapper Nick Young. Their debut EP was mixed and co-produced by Grammy-nominated producer Billy Hume (Lil’ Jon, Ying Yang Twins, Pitbull). Epoch Failure’s first single “Champion” has become a breakout sync track in the sports world. This past February, it was played during the post-game celebration of Super Bowl 50 in San Francisco. It’s also been featured by The NFL Network, ESPN, Fox Sports, NASCAR, WWE, NBC Sports, NY Knicks, NY Giants, Denver Broncos, the Australian Football League, and more. 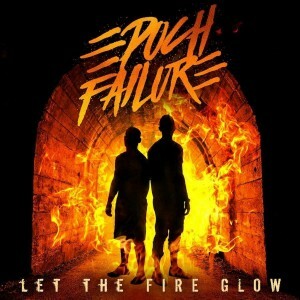 Epoch Failure’s latest single, “Let the Fire Glow”, is a powerful, anthemic pop song with lots of urban swagger. 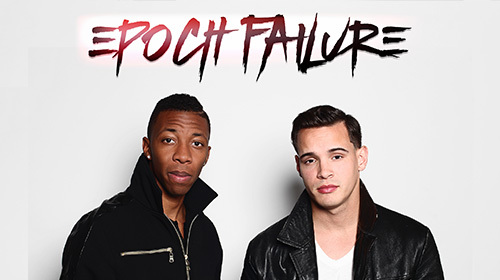 In much the same spirit as Epoch Failure’s previous two singles, this new track is also built on a foundation of heart and grit that’s derived from the firsthand struggles these two Jersey natives have endured and overcome. The song is a celebration of all those daredevils and dreamers who refuse to cave under the pressures of social conformity. Instead, against the odds and against the grain, they rise and sing and fight –– leaving a blazing trail of inspiration in their wake. 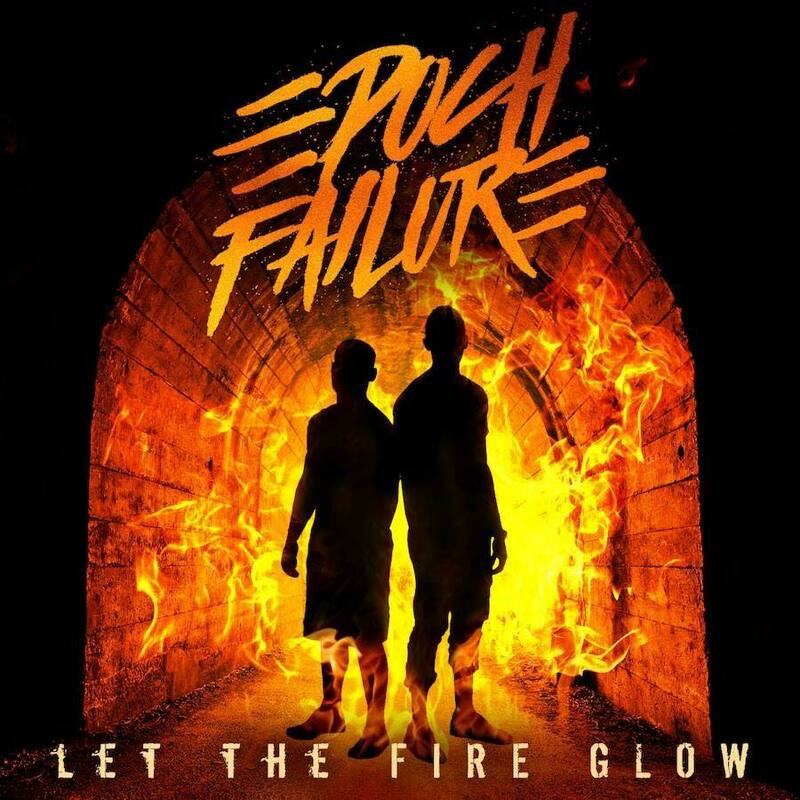 In many ways, Epoch Failure’s first three singles create a perfect sonic portrait for these work hard, play hard guys who are all about fully embracing every new moment and challenge that life has to offer. Thanks for your time! Now that we are more than half-way through 2016, what are some words you would use to describe it? 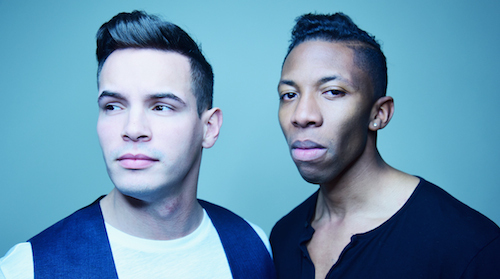 What were some of the highlights of 2015 for your music? NICK- So far, 2016 has been a whirlwind ride. We’ve played our biggest shows yet, and it’s been moving at a fast and furious pace all year long. We came in like a lion, and with our new “Let the Fire Glow” video coming out next month, it looks we’re gonna go out like a lion as well. In terms of 2015, some of the biggest highlights included our song “Champion” being used as the theme for NFL Network’s “Inside Training Camp”, having our songs featured by NASCAR, WWE, ESPN, Fox Sports, and more. Also, a huge highlight was receiving praise from Jon Bon Jovi for our interpretation of “Livin’ on a Prayer”. NICK- I have always loved music. And I’ve always loved being creative. Initially, I communicated through other mediums of art. Then I began writing poetry… and eventually turned my poetry into lyrics… and then my lyrics became songs. It was a natural, organic progression, as if my soul was learning to crawl and then walk. My earliest musical memories include watching Purple Rain on VHS with my brother and sister when I was five. After that, I wanted to be Prince. In fact, I still want to be Prince. From Prince I learned that talent and drive will get you far, but personality will push it over the top. BILLY- I can’t recall a time when I didn’t dream of being a musician, and becoming a star. I got my first piano at age five, and since then I’ve never stopped wanting this more than anything else in the world. How did Epoch Failure first come together? How did you meet each other? How did you get your nick-names? What is hard to come up with your band name? What other names were you considering? NICK- We met through Billy’s cousin who was in my Army unit. At the time, Billy and I were both doing the solo artist thing. Through a long and arduous courtship process, I finally got him to commit to collab on a song with me. (I guess he had some hang-up about rappers.) Anyhow, the chemistry was undeniable, and here we are. My nickname comes from Woody Harrelson’s character in the movie “Natural Born Killers”. It was an awesome movie, and I felt like he was misunderstood, so I adopted the moniker Mickey Knoxx. However, people were confused because my given name is Nick, so they would always call me Nickey Knoxx. After a while, I just went with it! When we came up with the band name we were celebrating the making a song called, “Where I’m Sposed to Be” (which ended up being our first single). Billy and I both agreed that our name needed to be something epic to fit the music, and to line up with all the extreme life experiences we’d each been through. I offered up the play on words “epoch,” as in an era of drastic change. Then I followed with the word “failure,” as in this would be our last epoch of failure. We went with the Americanized pronunciation of “epoch,” playing off the popular internet hashtag EPIC FAILURE (minus all the kids doing stupid things and hurting themselves). Can you talk about how your original single, “Champion”, the cover of Bon Jovi’s “Livin’ on a Prayer” came to be? Where did the idea for it come from? BILLY- “Champion” definitely came straight from the heart. At the time, Nick and I were in hard places. We were going through some challenges in our music career and other things in our lives that we couldn’t shake off. “Champion” was a product of that frustration, and it fueled this “never say die” mindset that we took on. With that in our hearts, we just started to run with it and let tape roll. “Livin’ on a Prayer” was almost a year long process. We wanted to do a cover to drop on YouTube, but we wanted it to be a song that meant something to both of us. Being from Jersey, Bon Jovi was a hero of ours and that song was an anthem with a message that meant a lot to us growing up. We felt a lot of pressure taking it on. We didn’t want to settle for anything less than perfect. We wanted to keep the same spirit and magic of the original, while also putting something personal into it. We revised the beat, lyrics, tempo, structure over and over. Nick really brought heart and emotion to it by putting a firsthand, personal spin on the lyrics. After all that time and work, when we posted it on YouTube and Bon Jovi found it and shared it on their sites… it was the ultimate stamp of approval. Nick and I were both blown away. Your newest single is “Let The Fire Glow.” How do you think this song compares with anything else you’ve released? What was the inspiration for it? How were your latest summer shows? What were some of your favorite venues and crowds to perform for? Where can people see you perform next? NICK- This spring and summer have been amazing. We traveled a lot and played all types of venues. My favorite venues/gigs have been Level 2 in Harrisburg, PA, NJ State Fair at Meadowlands, and Summerfest in Milwaukee. We’re kicking off our fall schedule in Philly, then in the first week of September we’ll be playing in The Hamptons… pretty excited about that. Through the end of September and into October we’ll be heading further north for some dates in New Haven, CT, and Worcester, MA. Your music has been featured in a lot of TV spots. Can you remember where you were the first time you heard one of your songs on TV? What’s been the most memorable spot? BILLY- The first placement we got was with our song “Where I’m Sposed To Be”, and it was on a reality show. I think Bad Girls Club. It was a short usage, but it was awesome. It made me feel like we had finally arrived, and I was beginning to live my dreams for real. My favorite placement was probably when our song “Champion” was used for the WWE Slammy Awards last years. I grew up being a big fan of WWE, and watching a lot of wrestling. Back then, I always loved seeing the highlight montages. So to have our song used in a two and half minute montage for the Slammy’s “Superstar of the Year” award, which is like the biggest one, was really special for me. NICK- For me, the most memorable moment was when “Champion” was played in stadium this year at Super Bowl 50. The in-game music director had told us he planned on playing it, but you never know how things will go. So I was watching with friends and family… waiting… and listening. Then, suddenly, in the background while Peyton Manning was being interviewed, our song kicked in. You could hear it blasting in the stadium during one of the biggest moments in sports. It was an amazing feeling– like we had just won the Super Bowl! What has it been like keeping up with social media at the early stages of your music career? Do you try and have fun with it? NICK- Social media is amazing. It’s been a great way for us to get ourselves out there as we build our brand and our name recognition. These platforms give everyone a voice, which comes with potential for good and bad. For us it’s all been positive. We love that we can reach listeners worldwide. We try to keep the content constant and dynamic, so our audiences don’t get bored. In general, we have fun with social media, while keeping in tune with our brand and on point with our overall message. NICK- I think the most surprising thing about the music industry is the perception vs. the reality of an “overnight” success. I’ve learned that some of my favorite artists, who seemingly came out of nowhere, had really been working on the scene for years and years. It really takes a lot of personal sacrifice and resiliency to keep going while you’re hanging in there for that big payday. In terms of what has come naturally to us, it’s the ability to stay humble, and to celebrate every small victory. Where we come from, and where we grew up, people like us don’t get chances like this very often. So we truly feel that every day we can continue on this path… it’s a triumph and a blessing. BILLY- The challenge is that it’s a 24/7, 365 job. There are no days off in the pursuit of success and greatness. From the outside, people are lured by the shine and the sparkle. However, few can endure what it takes to get there. And growing up how I did, the work ethic aspect is the most natural for me. I’m used to the blue collar “get your hands dirty” kind of approach. Who are some of your favorite artists and what bands continue to inspire you and your music? Who would you two love to work with in the future? NICK- Some artists that have influenced my style and my passion as a rapper are: Nas, Jay Z, and Joe Budden. Artists that have influenced me musically are: Prince, Mobb Deep, Sublime, and Blink 182. I’d like to think that Epoch Failure delivers a mash-up of all of my favorite artists into one. In terms of newer artists, I love Imagine Dragons, Twenty One Pilots, Alessia Cara and not ashamed to admit… Justin Bieber. I feel these artists have broken molds and really taken things back to artistry and personality. I would love to work with anyone who is as passionate about the art as we are, and who is willing to put in the work to make a great record. BILLY- I’ve got a wide variety of influences, and artists who inspire me. Being from Jersey, I love Frank Sinatra, Bon Jovi, Billy Joel, and Bruce Springsteen. And focusing more specifically on urban genres, I love the Beastie Boys, Outkast, Kanye West, Kendrick Lamar, Lupe Fiasco, and of course, Eminem. Someday I would love to work with any and all of the following: Kanye West, Tyler The Creator, Fall Out Boy, The Killers, Taylor Swift. Also, I love Becky G, so that would be a dope collab. NICK- I hope what comes across is the reality that we are just regular guys, who have regular problems and celebrate the same small victories everyone else does. We’re guys who make mistakes, who might drink too much once in a while, or who may say what we feel because we care or because we don’t, even if it’s not the PC thing. We’re imperfect, but we are inspired and passionate. I hope that our music sparks something inside of everyone that listens, so they follow their dreams and never give up despite the obstacles and roadblocks. If we can do it, so can you. BILLY- At the end of the day, we’d like people to be inspired. We’d like to help motivate them to have fun, live life, and be proud to be different. And if some young kid is inspired by our music and message, and able to change their path and better their life as a result… mission accomplished. BILLY- The video for our new single “Let the Fire Glow” will be coming out in September. We can’t wait to share it with everyone. It’s action-packed, and full of heart. Just like us. Also, shout outs to our awesome band members Mad Mike, Low Down Dirty Shane and DJ Big Jae. NICK- And huge shout outs to all these early believers who’ve gotten on-board, and supported us: North Star Media, Collective Detroit, Right Angle PR, Jon Bon Jovi & Desmond Child, Courtney Welch at Fox Sports, Kevin and Claude at ESPN, Christine Black at The NFL Network, Aaron Matusow at WWE, David Silbaugh at Summerfest, and Ray Castoldi (MSG, MetLife). We couldn’t be where we are without them.